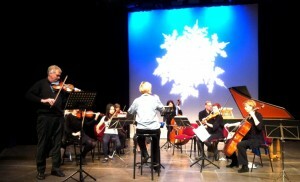 Vivaldi | Music Matters | Because it does. Doesn't it ? This Easter, the Cecilian Choir and Sinfonia explore the dark side of Vivaldi, his Credo and Magnificat, two ferocious statements of religious belief that are shaped by the fear, uncertainty and death that coloured Venetian life at the time. Less than a hundred years before the composition of the Credo, the population of Venice had been devastated by a particularly fierce outbreak of the Black Death; a scant two generations separated the fearsome death-toll, accounting for nearly a third of the population, from Vivaldi’s writing. The city had been riven by plague five times; after each, relieved and terrified citizens gave money to the building of so-called ‘plague churches,’ in the hope that thankfulness and prayer would save them. It was a time when the prospect of Purgatory and Hell was all too real, and the awareness of the fragility of human life hovered at every turn. The mood of the times is captured perfectly in its art, too. 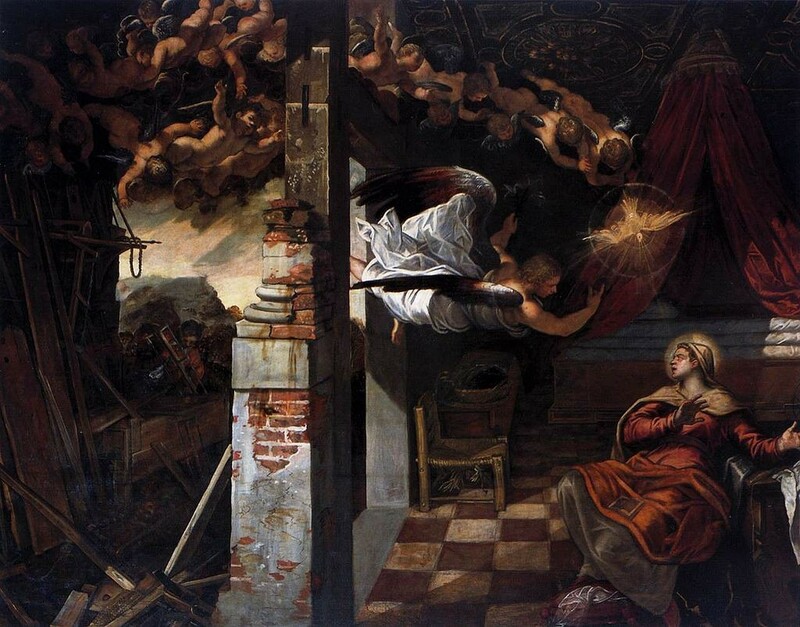 One of the plague churches, the Scuola di San Rocco, houses Tintoretto’s Annunciation, painted between 1583-87; but this is no dewy-eyed moment of revelation. Instead, the angel and various cherubs tumble out of dark, louring skies to find the Virgin amidst ruin, tumble-down woodwork, executed in a dark, sombre palette with only a hint of clear skies in the distance. The same sense finds expression in Vivaldi’s music, with sheer drama realised musically in stark black and white with vivid contrasts. Part of a large collection of music written between 1713-17, the Credo is no rose-tinted joyous affirmation of faith; rather, it’s a fist-clenched proclamation, driven by a very real fear. The sombre E minor tonality broods throughout the first and last movements – there is no escape from its relentless grip. The mystery of Christ’s birth is expressed in slowly-evolving harmonies in the ‘Et incarnatus est,’ which move in unexpected ways as we marvel at the incarnation of God in the flesh. But the mood is dispersed in the ensuing ‘Crucifixus,’ in which the steady, unremitting crotchet pace of the lower strings takes the listener on each step of the walk to the crucifixion with Christ himself, underlined in the angular shape of the fugal idea. The phrase ‘Passus est’ (He suffered) sighs through the choir in sympathy with Christ’s misery, rising to a peak and then gradually subsiding onto ‘Et sepultus est’ (He was buried) in a very low tessitura. The last movement’s ‘Et expecto resurrectionem’ is delivered in an almost manic intensity, underlined with stark homophony, giving voice to a very real desperation as much as it is a declaration of belief; I expect – nay, demand – the Resurrection of the dead because I have little else left to me. 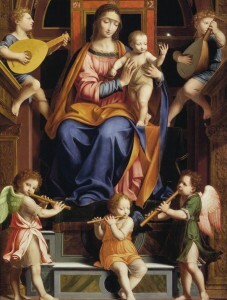 Similarly, the Magnificat celebrates the Virgin Mary not only as the Mother of Christ but as a Protector of the Venetian Republic, as another prospect of hope in these plague-ridden times. The grand sonority of the opening moves from a brooding G minor through a series of gradually heightening dissonances before returning, inescapably, to the tonic; hope is scarce. A quantum of solace is offered in the dancing ‘Et Exultavit,’ but it is all too brief; the aching dissonances of the ‘Et misericordia’ movement unfold hesitantly, as though the musicians themselves don’t know how the music is going to proceed. Then comes the truly astonishing heart of the work: two fiercely declamatory movements – ‘Fecit potentiam’ (He hath shewed strength with His arm) as much a comment on the devastation of the plague as it is on the might of God – followed by choir and orchestra coming together in a ferocious, unison ‘Deposuit potentes’ (He hath put down the mighty from their seat), railing with anger, and with the choir in full spate in ceaseless quaver runs. The final ‘Gloria’ is given menacing overtones in its return to the tonic minor, and a vigorously fugal ‘Et in saecula saeculorum’ seems to suggest that the consolation of eternal salvation is a long way off. After the cascading fugue, the piece finally offers hope in its conclusion in the major – but Vivaldi makes you wait until the very last chord. Fear, plague, darkness; these elements combine to inform two of Vivaldi’s greatest choral works, revelling in the drama and the fervour of the text. 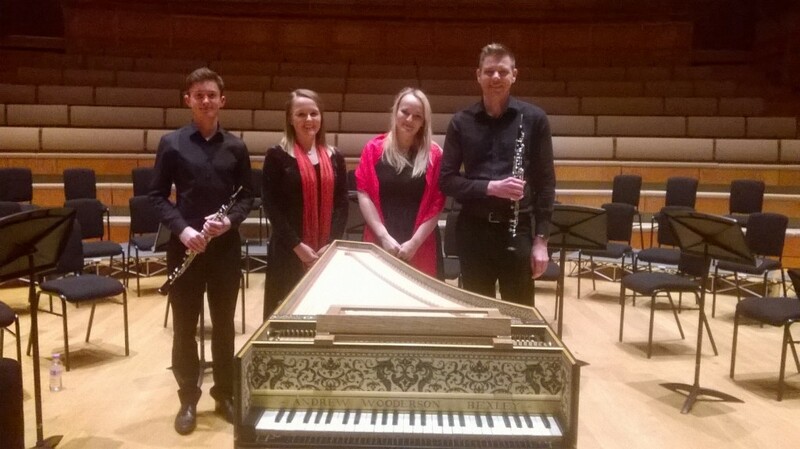 The concert on Thursday 31 March also includes Mozart’s sublime Ave Verum – a lyrical antidote to the Vivaldi, yet not without its intense harmonies too – and a Vivaldi trio sonata. The light, airy interior of St Peter’s Methodist Church, on the High street in Canterbury, will, for one afternoon in March, become a Venetian plague church, with its hopes, dreams, fears and beliefs brought to life in Vivaldi’s vivid music; admission is free, find out more here. 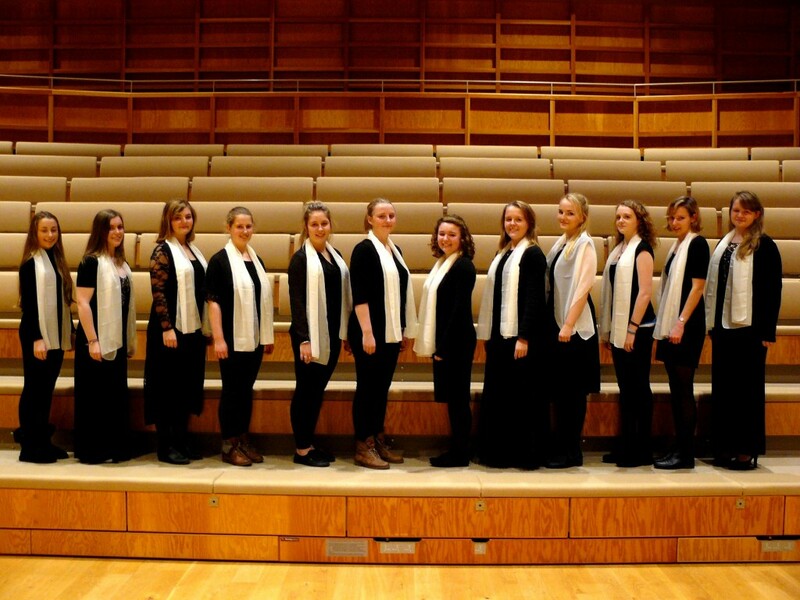 Vivaldi’s enduringly popular Gloria forms the centrepiece of the annual Crypt Concert at Canterbury Cathedral next week, in a performance for upper-voices by Minerva Voices. 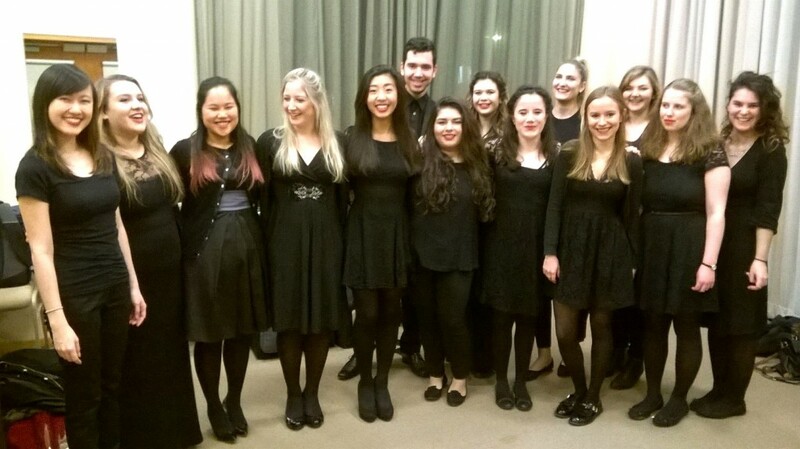 Fresh from its concert at Studio 3 Gallery last week, the University’s auditioned upper-voices chamber choir will bring the Crypt to shimmering life on Friday 26 February with Vivaldi’s masterpiece, in a programme that also explores repertoire from the medieval to the present day. 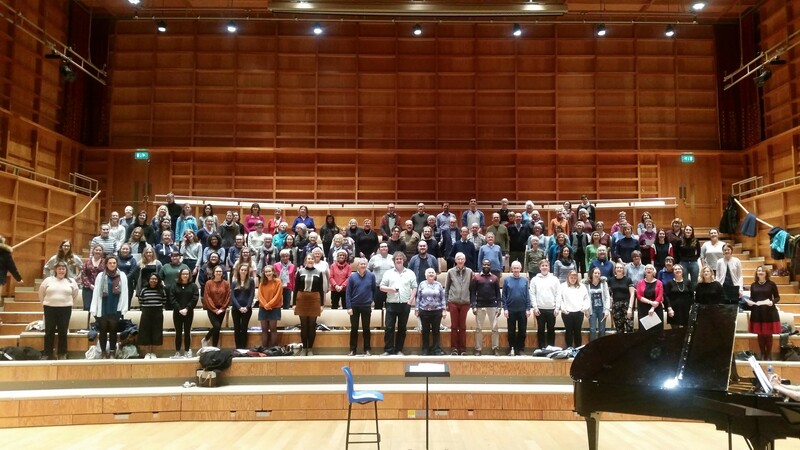 The first half of the concert will include works by Hildegard von Bingen, Mozart and Brahms, as well as Veljo Tormis’ filigree Spring Sketches and Bob Chilcott’s radiantly colourful Song of the Stars. It’s a terrific opportunity to hear Vivaldi’s radiant, celebratory Gloria in an upper-voices edition which may well have been familiar to audiences during Vivaldi’s lifetime, written as it was for the young voices of the Ospedale della Pietà in Venice. 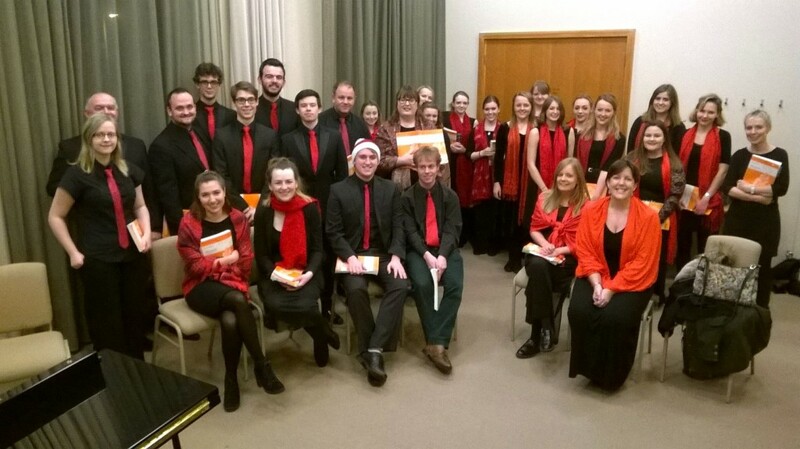 The Cathedral Crypt is a wonderfully evocative venue in which to perform, and the Choir is eagerly anticipating the opportunity to fill the sonorous space with such a richly-hued programme; join us on a voyage charting choral music across the centuries and Vivaldi’s crowning glory, in the magical surroundings of the Cathedral Crypt next Friday at 7.30pm. More details online here. Continuing the series profiling Music Performance Scholars at the University. 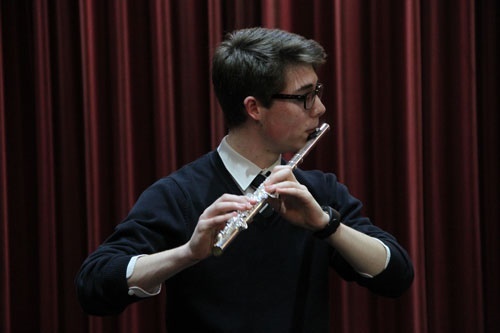 This week, first-year flautist and bass reading Computer Science, Robert Loveless. I first started flute back in primary school, where if you wanted music lessons in school, flute was the only option. I gave it a shot and have never looked back since! 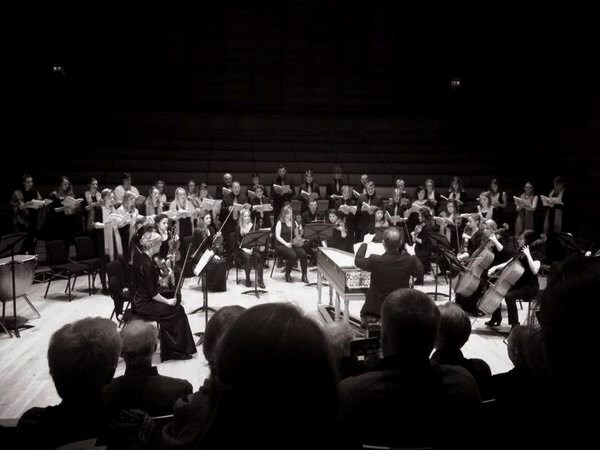 After a while my teacher introduced me to the West Sussex Youth Orchestra in which I moved up through the various bands and orchestras throughout my years there. Although this seemed daunting at first, it was here that I became hooked on the buzz of ensemble playing. As well as discovering loads of new music, I started playing piccolo there. I later moved to Hurstpierpoint College where I had the opportunity to join a whole host of new ensembles. This included choirs as I had now started singing, however the Jazz band was my new favourite because I had started working on some jazz repertoire with my new teacher. Improvisation was especially enjoyable for me – In my lessons I would try to get away with as much as he would resist before he would give in to join me in a jam session until the lesson was up! I also gained a keen interest in chamber music on the singing side and would later get to sing with the choir in residence at the national pilgrimage in Walsingham. Other personal highlights include performing Vivaldi’s La Tempesta Di Mare Concerto accompanied by a full orchestra – a memorable experience! During my A-levels at Hurst I took Music Technology which allowed me to dabble in writing and recording my own music. The technological aspect of this was particularly interesting to me as a computer scientist and is an industry I still follow closely. 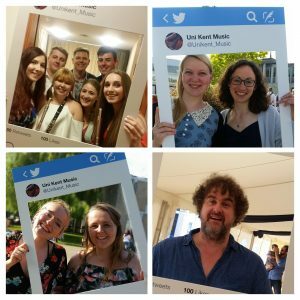 Now at Kent, I am very glad to be able to not only continue with music and developing my skills but also meet likeminded people with whom I share a common passion. I currently participate in the Concert Band, Flute Choir, Chorus and Cecilian Choir. The performances these ensembles have been in so far were thoroughly enjoyable and I am really looking forward to those yet to come, in particular the upcoming cathedral concert. 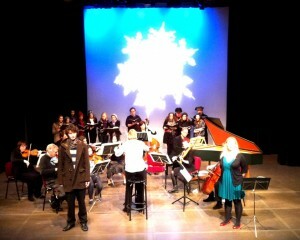 The University Camerata and Cecilian Choir teamed up for yesterday’s final lunchtime concert of the term, with Vivaldi’s Winter and Purcell’s ‘Frost Scene’ from King Arthur. 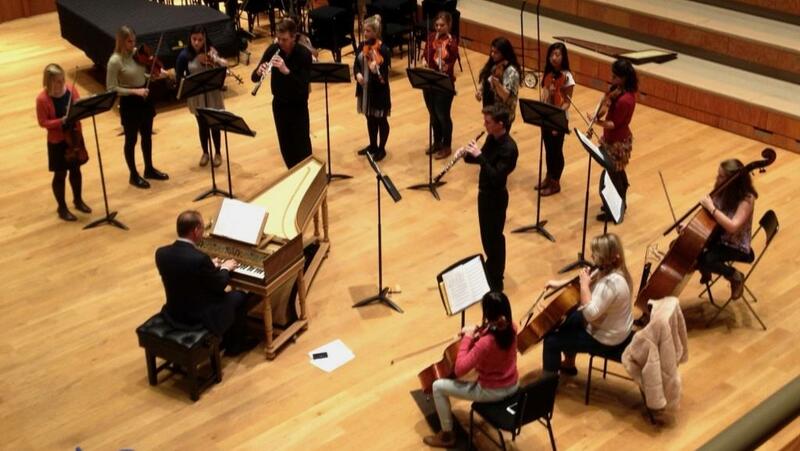 Soloist in the Vivaldi, Jeremy Ovenden brought out the brittle, biting aspect of the piece in a strong, confident reading, and the Camerata responded with suitable fragility in the sul ponticello passages. Making her debut at the Gulbenkian, Music Scholar Paris Noble cast a bright flame as Cupid, scolding the Cold Genius (a welcome return for alumnus Piran Legg) and bringing on a chorus of Cold Revellers to warm them up and spread love throughout the arctic countryside. The Cecilian Choir, looking suitably chilly in winter hats and coats (there had been a fire-alarm that morning, so the musicians ended up waiting outside the Theatre for a while – true method-acting, as one of the altos wryly observed), shambled on before casting aside their winter attire for a heroic closing chorus. Pictured also is the fine harpischord brought in for the concert (Christmas truly came early for me this year), a Ruckers-Hemsch copy by Ian Tucker, based on an instrument from 1763, which had a soundboard decorated identically to one owned by Handel. 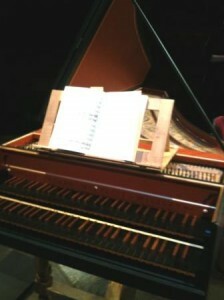 Many thanks to Edmund Pickering for delivering and tuning the instrument.